Push notifications are those messages that are clickable and are sent to the user's mobile phone from a mobile app. These messages are sent and delivered in the real time. Users can easily look them as pop up notifications on the home screen of their mobile device and also at the lock screen. Push notifications arrive on the mobile screen even if the user is not using the app. This feature is supported by all the operating systems such as IOS, Android and windows. This service is introduced so that the user can get the latest update related to the business and can enjoy the benefit. As the use of mobile phone is constantly increasing, businesses are focussing to move their marketing platform mainly to the phone. It has become a growing digital platform that is simple, easy to use and engage the customer to the business activities. According to research mobile users spend their almost fifty percent time in using the mobile phone. Thus, reaching to the customers mobile is highly advantageous for the business growth. Send interactive and rich messages: Push notifications help you create interactive and rich push messages such as gif's, videos etc. There is a tool which can be used to introduce images, videos and gif's to your push message in an easy way. The edit option can also provide you with the facility of previewing before sending. 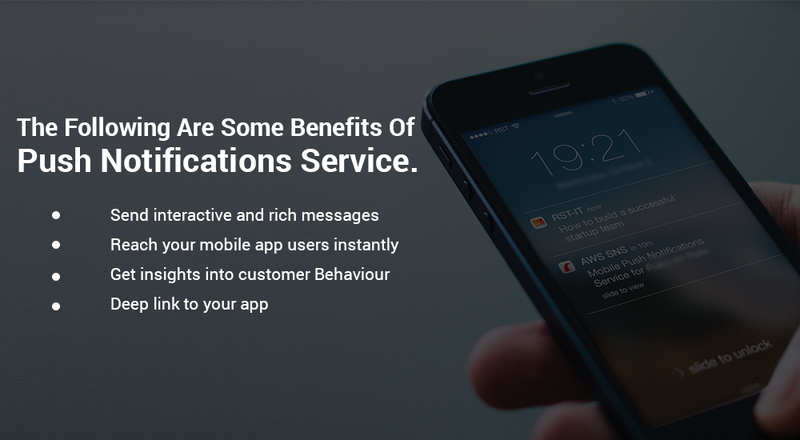 Reach your mobile app users instantly: The push notification service assures the delivery of the message to the user. This platform has taken a lead over SMS marketing as the user does need an access of network for this service. Get insights into customer behaviour: It helps businesses by tracking to gain customer insights. The business can plan their strategy following the customer behaviour. Deep link to your app: The service can let you introduce deep links to the messages which can help the user by directing to the specified link.